The covers of a book enclose worlds constructed of text and image. To open a book is to expose the intimate details of story, experience and idea. Part of the J. Willard Marriott Library since 1995, the Book Arts Program champions wide-ranging explorations of the book. 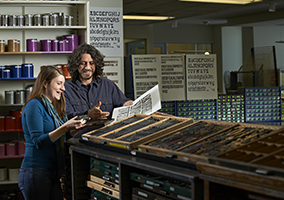 In our fully equipped studio, bookbinders, printers, and book artists utilize type, letterpress, photo engravings and bookbinding equipment as they combine traditional techniques with modern aesthetics and technology.